P1165. 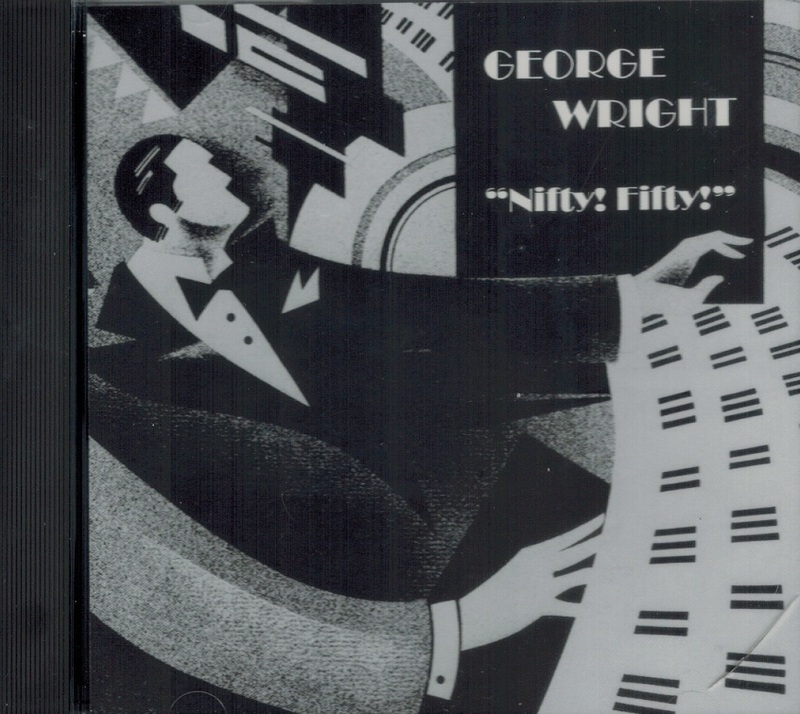 GEORGE WRIGHT (Hollywood Philharmonic Organ): 13 George Wright favorites. Banda 38480S. 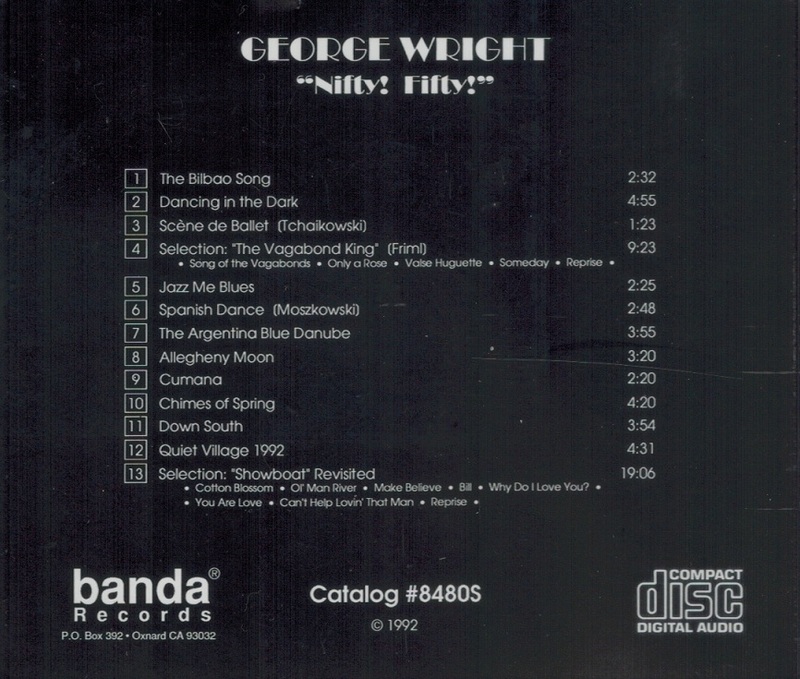 “George Wright was an American musician, possibly the most famous virtuoso of the theatre organ of the modern era. Wright was best known for his virtuoso performances on the huge Wurlitzer theater pipe organs at the famed Fox Theater on Market Street in San Francisco and the ornate Paramount Theaters in both New York and Oakland . He was in constant demand during the 1940s, '50s and early '60s, playing at concerts and recitals around the world. In 1938 he had his first playing job at a Chinese night club in Oakland called the Shanghai Terrace Bowl which boasted a 2-manual, 6-rank Wurlitzer; the show was broadcast nightly by an Oakland radio station. In 1941, he joined San Francisco radio station KFRC and performed at the Fox Theater on Saturday nights. In 1944, he relocated to New York City to work as organist and musical director at the Paramount on Times Square. He began recording at this time, first cutting 78 RPM records for Syd Nathan's King Records. In New York he played on Jack Berch's NBC show and later guested with Paul Whiteman and Percy Faith, as well as on the network shows of Bing Crosby and Perry Como. He also conducted his own orchestra on the Robert Q. Lewis show and began a seven-year stint playing in a trio with Charles Magnante, accordionist, and Tony Mottola, guitarist, for an NBC show sponsored by the Prudential Insurance Company. In 1949, he signed on as house organist for the Paramount Theater in New York. There, he played with many of the great jazz and pop artists of the time, including Frank Sinatra, Frankie Laine and Ella Fitzgerald. He moved to Los Angeles in 1950 as ABC's musical director for the West Coast. During his early years at ABC, Wright continued to perform live theater. Though live theater variety shows had pretty much died by the late 1950s, Wright developed an avid, if cult-sized, following during this time and was able to fill big variety-era theaters long after their main audiences had shriveled. Wright became renowned among theater organists for his pyrotechnic virtuosity, devising novel effects and pulling off lightning-fast stop changes. During his long career, George Wright played a key role in reviving interest in theater organ music. He recorded more than 60 albums, some of which sold more than a million copies between the early 1950s and 1960s. 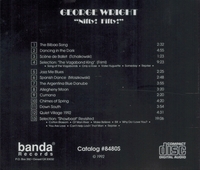 Wright was the first act signed to Hi-Fi Records, and recorded 20 albums as their featured organist in the late 1950s and early 1960s before switching to Dot Records in 1963. On his Hi-Fi albums, Wright is a perfect complement to the label's star, Arthur Lyman - except that Wright produces bird squawks, screeches, and other jungle noises with the organ alone. Wright bought a house in the Hollywood Hills less for its location than its capacity to accommodate his own mighty Wurlitzer pipe organ. He worked on it constantly, swapping out pieces he collected in his travels around the U.S.